Balance is the key to life, I'm convinced. As such today I sought to take it to a new level. I began the day with a nice motor run out to an un-inhabited section of the lake where we turned our son loose with his inflatable dingy to play. 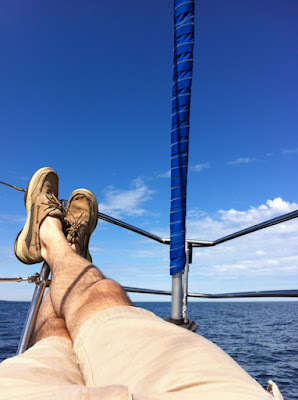 I then proceeded to grab a pillow and lounge on the bow enjoying my boat and the weather about as much as is possible. We sailed back in light winds making about 3.25 - 3.5 knots under full genoa. As always, Ravat sailed like a dream. Perfectly balanced, and rock solid. Can you tell I love this boat? When we returned to the dock I made a run for West Marine to cash in my Gold Rewards which had been accumulating. I had $90 worth to redeem, and I did so on the purchase of a Fusion Marine Stereo which I'll install next weekend. The wiring is in place and ready, so I just need to get the bulkhead panels in place to mount it. I also picked up some miscellaneous electrical connectors. Upon return to the E dock I lounged with my Wendy's lunch while pondering my looming wiring project. I then proceeded to finish wiring the bilge pump switch, and correct the wiring on the fuel gauge which now does its job wonderfully. No more dipping the stick in the tank to measure levels. All I need now is an hour meter on the engine and I'll be reasonably instrumented. I'm on vacation from work all next week and have the grandest of ambition when it comes to the work I'll get done. Should be an exciting week for blog updates and for Ravat herself.